All it took was Trump firing off 59 cruise missiles against Syria for most leading Democrats, who had been posing as staunch Trump opponents, to start singing his praises. Senator Chuck Schumer said it was “the right thing to do.” The “militant” Senator Elizabeth Warren said the “Syrian regime must be held accountable.” The “radical” Bernie Sanders condemned Assad as a “war criminal” while mildly criticizing the war criminal Trump for not consulting Congress first. Right before the Syria attack, Democratic Party standard-bearer Hillary Clinton called for going further than Trump did and “taking out Syria’s airfields”—something which would require hundreds of major strikes, with the potential for unpredictable escalation. Life is a horror in Syria, because of the murderous Assad regime and its allies—and Assad’s reactionary opponents and their backers, including the United States and its allies. But was Trump emotionally moved to strike by pictures of dying children? If so, why hasn’t he been moved to stop the U.S. bombing strikes he’s ordered, which killed 70 Syrian children last month alone? And what about pictures of the 1,500 children in Yemen, most of whom have been killed by American bombs dropped by U.S.-backed Saudi Arabia? Or the 462,000 in Yemen suffering from severe, acute malnutrition—starving to death—right now? Trump and his regime have reportedly been moved to action in Yemen—to increase their support for the child-killing Saudi bombing campaign and its child-starving air and naval blockade! In attacking Syria, Trump saw the need and opportunity to act the “strong man” and show the world and the Middle East region that there’s a new, more ruthless “sheriff in town”—and he may have possibly wanted to shift America’s domestic political terrain in his favor. This was fascism flexing its muscles...and attempting to rapidly consolidate its power! The Democrats are spinning Trump’s illegal, immoral, imperialist air assault as an act of humanitarian concern for children. And they aim to rope the oppressed and the more enlightened, progressive-minded segments of U.S. society into supporting U.S. aggression. (Generally speaking, the Republicans’ hard-core “America right or wrong” social base doesn’t require such justifications for murdering people around the world.) America may not be perfect, the Democrat leaders say—we make mistakes, but “our” intentions are noble, and America and its military are overall a force for good in the world. In reality, America and its military has never been a force for good in the world—anywhere. For facts on this, see the revcom.us piece “Think the U.S. Military and CIA Can ‘Do Some Good’? Read About 15 Times That People Went Along with That—and Then Think Again.” That’s true in Syria as well, where the U.S. has been deeply involved in fanning the flames of a reactionary war, which has killed some 480,000 and forced over 5 million to flee for their lives. Many people—grassroots Democrats, activists, and people who have generally looked to the top Democrats to stop Trump—were shocked and angry that these same leading Democrats are now cheering Trump’s military action. Some denounce top Democrats as “cowards” and demand they unalterably oppose Trump. Many others are repulsed, confused or demoralized by leading Democrats’ salute to the fascist-in-chief. But the reason the leading Democrats act as they do doesn’t have to do with their spines or lack thereof. It flows from the reality that the Democratic Party isn’t the “people’s party” and never has been. They’re a ruling class party that represents American capitalist-imperialism, the same system the Republicans represent. That’s why the day after the election, Obama said of himself and Trump, “We’re all on the same team… We’re not Democrats first, we’re not Republicans first. We’re Americans first, patriots first.” He’s right; they are on the same team—the imperialist ruling class team! Bombing Syria? Turns out these top Democrats can mostly all get behind that! Why? Because Republicans and Democrats understand—and agree—that the survival of their capitalist system rests on and demands global dominance, including over regions like the Middle East, and the Democrats thought Trump’s action was in line with that. At the same time, right now there’s a fierce battle between the different wings of the ruling class. It’s not over whether to maintain their white-supremacist, patriarchal system of global exploitation and oppression. They’re fighting over how to maintain it in the face of profound challenges, problems and discontent in today’s rapidly changing world. The Trump/Pence regime has seized control and is embarking pell-mell on the fascist restructuring of government and society. The Democrats feel that maintaining the traditional bourgeois democratic form of the rule—dictatorship—of their class is their system’s best hope. For the masses of people, fascism is a matter of life and death. For these rulers, it’s a matter of how to best preserve their rule. The Democrats may be genuinely alarmed by the Trump/Pence regime, but they are even more fearful that the millions and millions of Trump-haters will lose their faith in the Democratic Party—and the whole system—and start acting politically outside its confines and channels. So the Democrats have been fighting hard to keep people’s angst and anger within the system’s channels (pressuring Congress, etc.). And they’ve been framing the issue as whether or not Trump is a fit “commander-in-chief” who’s able to keep America “strong” and “safe” and protect U.S. “allies” and “interests.” In other words, they’ve been battling Trump in some ways, and at the same time working to channel anti-Trump anger and opposition into the framework of “what’s best for America”—that is, this imperialist system. Trump and this system aren’t all powerful—they don’t have it all wrapped up. The U.S. faces crises, difficulties and contradictions all across the world. This is what propelled a faction of the ruling class to take the radical and risky step of empowering someone like Trump and moving toward a fascist remaking of the U.S. Millions and millions hate the leader of this effort—Donald Trump—and they represent a force with the potential to drive out the Trump/Pence regime. But for that potential power to be fully unleashed, people need to confront what the Democratic Party and its leadership are really about, and break with the mindset of putting America and American lives above other people’s lives. 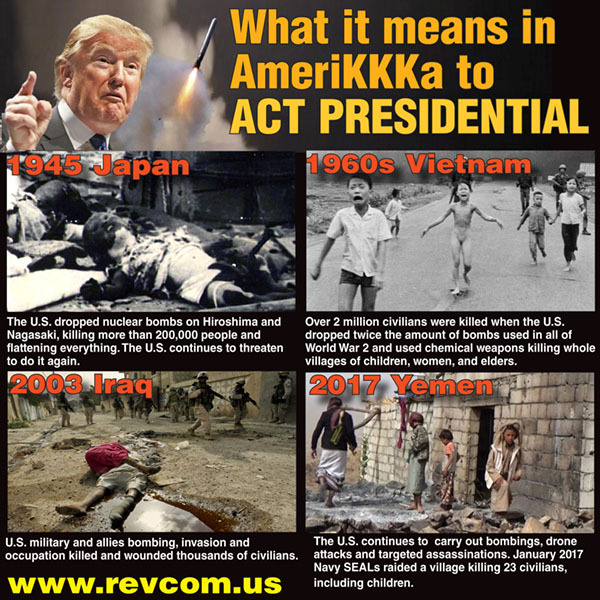 Otherwise, people will be constantly led back into supporting this system’s crimes, and accommodating to fascism—in the name of “protecting America” or “saving American lives.” We must instead put the world first, not America, and squarely confront the monumental danger to all of humanity and the planet of having a nuclear-armed, climate-crisis-denying fascist running this most deadly country on earth. And rise to our responsibility to move heaven and earth to oust this criminal regime. In short, it’s on us—the millions—to drive out the Trump/Pence fascist regime. As the Democrats’ response to Trump’s Syria bombing shows, waiting and counting on them to stop the danger posed by this fascist regime would be delusional, and devastating to the lives of billions and possibly the fate of the planet. 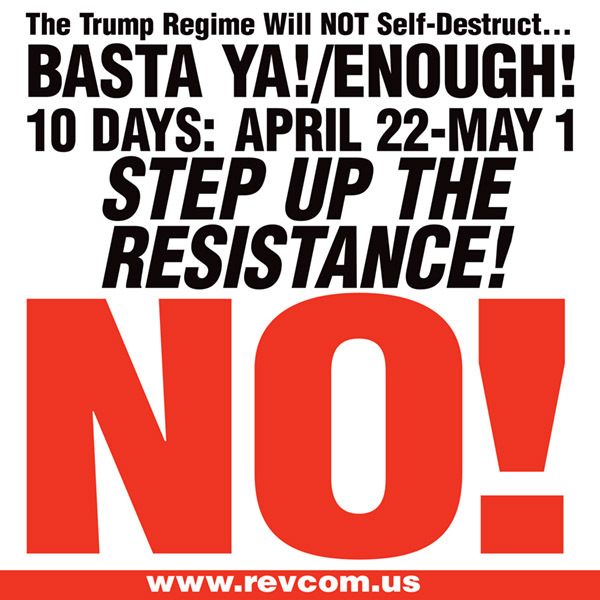 10 DAYS, April 22-May 1, the end of the first 100 Days of the Trump/Pence Regime, can—and must—become a big leap in a movement to drive this fascist regime from office. The stakes are nothing less than the future of humanity and the planet. Over the course of 10 DAYS, hundreds of thousands of people will pour into the streets in important and righteous protests in Washington DC and cities across the country aimed at three key fronts of the Trump/Pence Regime’s reactionary program. RefuseFascism.org endorses these protests and calls on people to attend and build for them. Join a National Organizers Task Force to help build for these events with the message of Drive Out Trump/Pence and their Fascist Regime…. Thousands of people must be organized, their creativity and determination unleashed so that this April marks a decisive advance in the struggle to put a stop to this fascist regime by driving it out. These are meaningful ways you can act. Where will you be? What will you do?